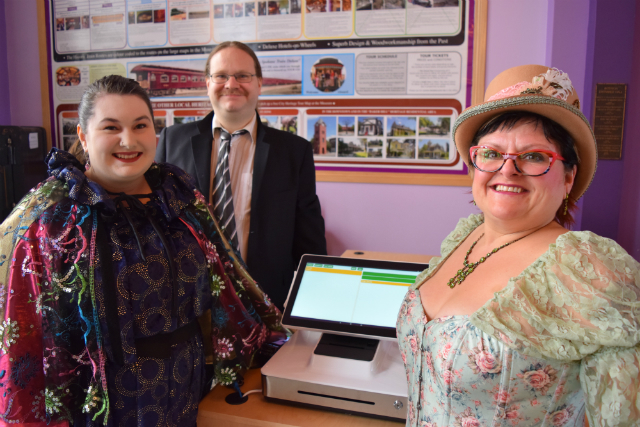 Tammy Morgan, Executive Director of the Cranbrook History Centre, is “very excited” about the installation of POS-n-go as the Museums new modern POS. The old POS was “already out of date when we got it,” said Morgan. They inherited a POS from a video rental store that did not provide any inventory control or extensive reporting like POS-n-go. Using the old system, History Centre staff spent hours “manually” preparing reports for Management, the Board and Funding Agencies. This took staff away from spending time on Museum work. POS-n-go Solutions recently installed a Elo Paypoint Plus all-in-one cash register along with a Pivotal Payments processing terminal at the History Centre. “Not only will we know what inventory we have, but we’ll know how many of an item we have and when to re-order,” said Morgan. With POS-n-go, inventory reports are one click away. POS-n-go tracks Museum tour sales and provides detailed reporting on the most popular tour, how many people take them and when they occur. The History Centre plans to use POS-n-go to record the time dozens of volunteers spend helping the Museum. Morgan will be able to know how much time volunteers donate for any given day, week, month or year with the easy to use reporting features of POS-n-go.